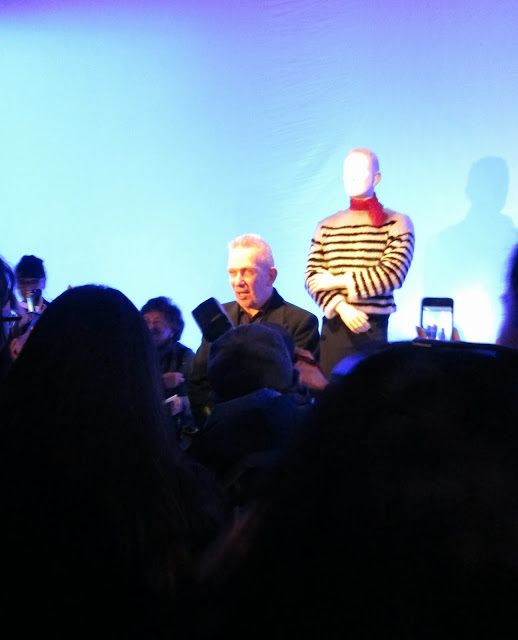 Jean Paul Gaultier at the preview of his exhibit at Brooklyn Museum. As close as I could get! Nearly two weeks ago, at the preview of The Fashion World of Jean Paul Gaultier: From the Sidewalk to the Catwalk, now on view at Brooklyn Museum, I wanted to speak to Mr. Gaultier just to tell him how much I loved the entire exhibit, but the crowds were too thick—photographers, TV camera crews, reporters. So I let it go and just enjoyed the inspiring remarks he made to the press, took plenty of notes, and left it at that. I went to the Manhattan Vintage Show three days later, which I attended with my photographer friend Denton Taylor and his wife Teresa. While we were at one of the booths admiring clothes I looked up to see Jean Paul Gaultier a few stalls down, looking over an item. No entourage, just him and a friend. I instantly knew it was him but no one else seemed to guess who was in our midst. 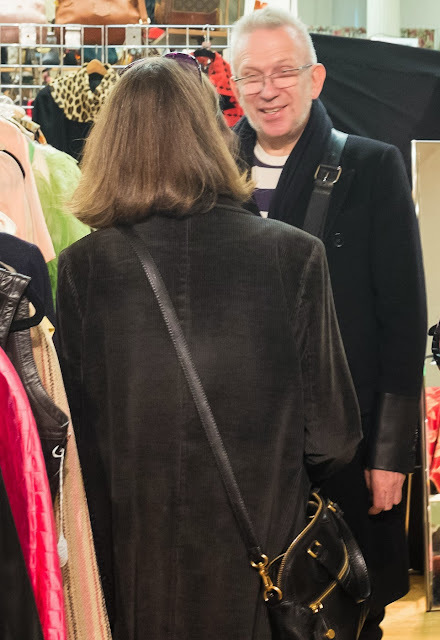 They probably weren’t expecting an iconic fashion designer to turn up at the show but I knew he was in town to help open the exhibit so it didn’t seem surprising to me that he’d also want to check out the vintage offerings on display. What made it seem fateful for me was that literally, two minutes before, I had been admiring a slinky black Jean Paul Gaultier dress, with quilted bra cups, bien sûr, that one of the vintage vendors had for sale. I don’t typically approach famous people outside of press previews, but this seemed like the universe was giving me a rare second chance to do what I had originally wanted to do, so against my normal restraint, I went for it. I got to tell him how much I enjoyed the exhibit, and how, as the daughter of a former U.S. Navy sailor, I particularly loved the sailor clothes on display. I also told him I was wearing stripes that day in honor of him, which was true, I had on a blue and white striped shirt and when I put it on that morning I instantly thought of him. I pulled my peacoat back to show Mr. Gaultier my stripes and he laughed. I do love a charming Frenchman, let me tell you. Luckily Denton got a shot of me talking to him. He’s smiling because I am piling on the compliments! All of which were true, his clothes have inspired me since I was 20 years old. Meeting JPG at the Manhattan Vintage Show! Photo by Denton Taylor. Have you ever gotten to meet somebody whose work you admire? Such a great story! Makes you wonder how many other famous designers stop into Manhattan Vintage. Anyone who happens to be in NYC during these shows should try and check it out, fabulous high quality stuff, definitely not a flea market. Quelle chance! So glad you spoke to him. I also have strong memories of him in the 80's in the fashion media and with Madonna of course. Love that you have a picture to document it!!! That is fabulous. Oh how lovely! I'm so glad you got to meet one of your longtime style inspirations. I'm glad he got to meet you, too! I am sitting here with a big smile on my face and I almost giggle, because I love your story so much. Thank you! I adore this story Jill! It brought be so much pleasure to envision you speaking to him and enjoying every second...just like a movie encounter. I am so proud of you for having the courage to speak with him Bravo! Jill, you have the most fun! Great story. I love the story and am pleased you took the opportunity to speak with him! It's not every day one gets to chat with a famous designer. What wonderful happenstance! Lucky lucky you. Wow, how wonderful that you were able to speak with him!! He looks like he's really enjoying the conversation. Wow, so cool Jill! I love the picture. He looks like a nice guy. Good eye! I am lucky to be able to spot celebs too when no one else does. My husband hates it when I say hi. I figure why not? Once, when I was young, I had my nails done in a salon next to Audrey Hepburn and she was very nice and smiled. I never had the guts to tell her how much I admired her. I regret that and swore I'd never blow a chance like that again.